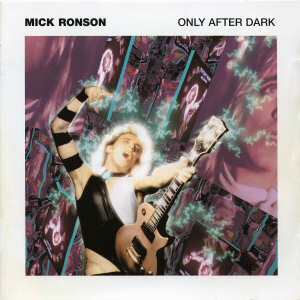 Mick Ronson CD: "Only After Dark"
For a long time Mick Ronson's first two solo albums were unavailable on CD. Then in 1994 Trident released this 2-CD set comprising Slaughter On 10th Avenue and Play Don't Worry. The packaging is different from the original albums, but the booklet contains some rare photos and a brief biography about Mick. The bonus tracks are welcome, comprising a couple of tracks from Mick's Rainbow theatre show in 1974, and some demos from 1976.